Aromas immediately transport us to good memories – and bad ones. My grandmother baked most yummy cinnamon streusel coffee cakes every week. Definitely reminiscent of a wonderful memory, the aroma of cinnamon immediately transports me to her kitchen and the desire to spend time with her again. On the other hand, the stench of stale tobacco takes me to a much darker place in my childhood and quickly sickens me. God created us with five senses to experience our world. The sense of smell is exceptional. Located in the nasal cavity, our olfactory gland is the only part of our nervous system that is exposed to the environment. Our sense of smell is also the only one of our five senses causing us to react first, and think second. Aromas emotionally affect us. Read the Apostle Paul’s instructions to us in Ephesians 5:1-2. Being a fragrant offering means people will react to us, whether good or bad, but most likely not indifferently. But thanks be to God, who always puts us on display in Christ and through us spreads the aroma of the knowledge of Him in every place. For to God we are the fragrance of Christ among those who are being saved and among those who are perishing. to some we are an aroma of death leading to death, but to others, an aroma of life leading to life. And who is competent for this? …EVERYONE we encounter each day. What is the aroma of Chirst? When I became fascinated with essential oils over a dozen years ago, a passion for them sprang up as I read my Bible with new insights and understanding of the emotional and physical effects of botanicals. Many plants grow throughout the Scriptures. The eyes of my heart opened to intriguing possibilities of why. The specific aroma of Christ remains a mystery, but I offer thoughts God has shared with me in our intimate moments. God and I camped out for years in Solomon’s Locked Garden (Song of Solomon 4:12-15). You will find nine fruits, spices, and oils listed there. In The Essence of Courage God led me to tie these to the fruit of the Spirit. (I was definitely not the first to make this discovery.) If we put on the fruit of the Spirit we put on Christ’s character. Connecting the dots, the fruit have aromas. Going in order Cinnamon represents goodness. And God is good . . . ALL the time. Eve jumped out at me as the woman of the Bible to represent goodness in The Essence of Courage. Click here to read her story excerpt from the book. God knew her (and Adam’s) sin, and pointed it out to them. He also knew His whole creation was good, including the man and woman He created in His image. While the conviction for their sin caused them to hide in shame, it provided the opportunity for God to reveal His promise of a Savior. Now that’s the most goodness we can ever hope for. I’m thinking cinnamon trees were definitely growing in the first garden! 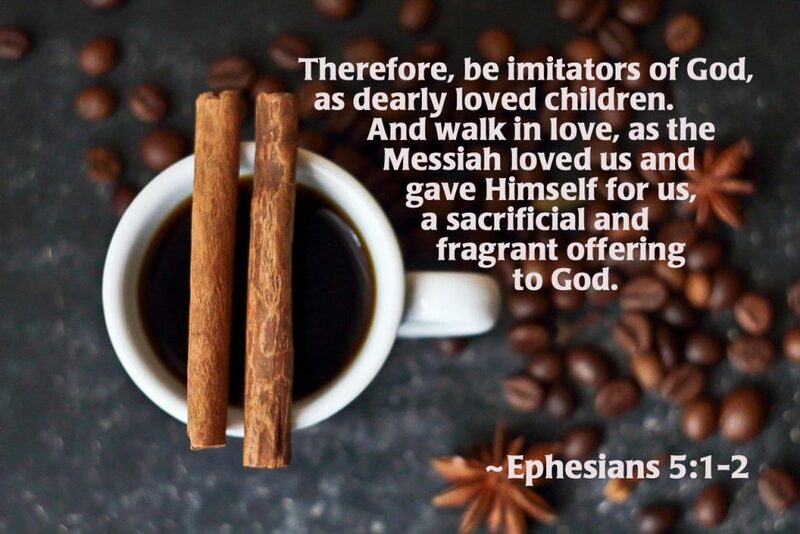 How do you carry cinnamon’s aroma – the fragrant reminder of Christ’s goodness with you? Is yours an aroma that others hope to encounter again and again? Do others wonder what you have, they do not? Will your aroma give Christ a good name or a poor one in an unbeliever’s eyes? Is it an aroma that brings The Message of the Promised Savior?